NOTE: Specific requirements can be found on the second page of each form. Those born in Germany after 01 January 2000 to parents who, upon said birth, 1) were both foreigners and 2) one parent has stayed in Germany legally for 8 years, and 3) the child has grown up in Germany, can now opt for both German citizenship and the citizenship of their parent’s country when they turn twenty one (21). The same exemption from the obligation to choose is applicable to those children of foreign parents who were born in Germany between 01 January 1990 and 31 December 1999 and were naturalized, becoming German citizens in the year 2000. Those children born of mixed marriages (e.g. Filipino-German) are entitled to both citizenships (dual citizenship) by reason of blood. Children born in the Philippines who were naturalized by adoption of German citizens. Note: Former Filipinos who have been naturalized citizen of Germany may apply but they may be required to renounce their current citizenship in the absence of the relevant dual citizenship law in the host country. The Citizenship Retention and Re-acquisition Act of 2003 (Republic Act 9225) shall apply to former natural-born citizens of the Philippines, as defined by Philippine law and jurisprudence, who have lost their Philippine citizenship by reason of their naturalization as citizens of another country. 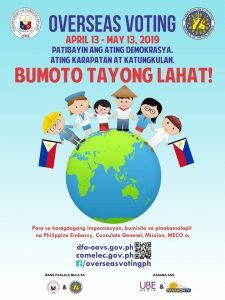 Corollary to the above, a former natural-born citizen of the Philippines who is abroad and is not an alien registered with the Philippine Bureau of Immigration shall file a petition under oath with the nearest Philippine foreign service post for the issuance of an Identification Certificate (IC) under Republic Act 9225. Qualified applicants shall submit the following documentary requirements personally at the Consular Section of the Philippine Embassy in Berlin, Germany. i. Duly-accomplished application form in triplicate. Such other documents that would show that the applicant is a former natural-born citizen of the Philippines as may be accepted by the evaluating officer. iii. Eight (8) recent passport-size photographs of the applicant, six (6) of which are taken against a white background and the two (2) against a royal blue background (BI Memorandum Circular No. MCL-08-006). Original Marriage Certificate, if applicable. Proof of acquisition of foreign citizenship (Einbürgerungsurkunde) from the Landkreis Emsland. This document must have an English translation by a licensed translator (vereidigter Übersetzer) and certified by the State Judicial President (Landgericht) where the translator is registered. If all initial documentary requirements are found in order, the Philippine foreign service post shall issue an Order of Approval and request the applicant to pay the processing fee of €45.00 and €22.50 for each qualified dependent plus €22.50 for the authentication of the Einbürgerungsurkunde. vii. As a final procedure, the applicant shall be required to personally take his Oath of Allegiance before an authorized official of the Philippine Embassy. viii. The Philippine Embassy will issue an Identification Certificate (IC) to applicants who have taken the Oath of Allegiance and whose papers have been forwarded to the Bureau. Re-acquired Philippine citizenship under Republic Act 9225 may be revoked by the competent Philippine authorities upon a substantive finding of fraud, misrepresentation or concealment on the part of the applicant. Republic Act 9225 provides for the acquisition of Philippine citizenship by children, below 18 years old, of former natural-born Filipinos who have successfully re-acquired Philippine citizenship under the provisions of the same law. For concerned qualified applicants, the same documentary requirements shall be submitted to the Embassy (include the original marriage certificate of parents). If born abroad (for minor children included in the petition of the applicant), the Birth Certificate issued by competent foreign authorities. Payment of processing fee of €22.50 per child included in the petition (per BI Memo Circular AFF. 05-002) plus fee of €22.50 per child for the Report of Birth that will be submitted to the Philippine National Statistics Office. Please be advised that the Embassy follows the “NO REFUND POLICY “ on fees paid by applicants for actual services rendered by the Embassy. “Actual services rendered” include, but are not limited to, services rendered from receipt of documents for review by the Consular Officer or, in case of payment, from the time of its receipt, and not merely restricted to the issuance of document. Fees for unserviced applications/applications no longer pursued are non-refundable.